18k Saudi Gold Necklace, 18” With Attached LOVE Pendant. Any questions please message me. Suzanne Somers Trilliant Cut Simulated Opal & Clear CZ Bracelet in Gold Vermeil. 7 1/2". Stamped 925. Condition is Pre-owned. Shipped with USPS First Class Package. 8" long and 29g / 10mm wide. Here for sale is this fine Hallmarked Locket and Hallmarked Chain,weighs 4.4 Gram. In nice condition,the locket itself looks to be Rose gold.fine looking piece and starting at a low price. Ending Apr 28 at 7:47AM PDT2d 16hFrom United KingdomMetal: Gold BondedStyle: LocketLength: 16 - 17.99"
This sterling silver necklace features yellow gold plating and a multi-strand design comprised of ten strands of ball and bar chains. This necklace has an adjustable length. Lobster clasp. 925 Sterling Silver. Since it's debut in 2008, the label is known for taking punk and tribal iconography and refining them into luxe, stream lined pieces. In recent Seasons, Chris has been exploring the idea of taking sterling silver and molding them into subversive orbits and spikes, while softening the pieces with pearl accents. Sterling Silver 925 Tricolor Riccio Chain V Pointed Rose Gold Necklace. Condition is Pre-owned. Shipped with USPS First Class Package. A twist on the ordinary, this distinctive chain necklace speaks for itself with flat links curved into a spiral. ‪Crafted from 14K yellow gold that's gone through a patented hardening process, this necklace is more durable and resistant to denting, scratching and breaking. This sterling silver necklace features round gold plated beads, silver tube beads and square tube beads. Lobster clasp. 925 Sterling Silver. Then we turn around and pass those savings onto you. New Orleans Silver and Gold. 18 k gold Cuban link chain. Each piece is hand-crafted using delicate, semi precious stones and beads sourced from Africa, India, and Thailand. Handmade in the USA. mystic quartz : 3mm x 2mm each. 18kt Handmade Gold Indian beads. necklace, open curb 45cm, 14K GOLD. Condition is New with tags. Shipped with FedEx Ground or FedEx Home Delivery. There are 5 large circles about 1" wide and 6 smaller circles about. 75". Closes with a lobster claw clasp. For those who may not know, the process of gold-bonding Sterling silver is a more expensive process than gold-plating and is more desirable, as plating can wear off pretty quickly. This pointed sterling silver necklace features a Riccio chain link design and an alternating pattern of silver, gold and rose gold plating. Lobster clasp. 925 Sterling Silver. DNT 925 ITALY. Then we turn around and pass those savings onto you. Has been worn before. Chain is about 18" long. Made of gold and the stamping looks to be 10K. Style: Cross Jesus Crucifix Charm. Up for sale is this beautiful Two Tone Jesus Crucifix 3D Cross Pendant. This is 100% real 1/10th 10K Yellow Gold (10%) & 9/10th. 925 Sterling Silver (90%). This pedant is very affordable and cost fraction of the price compared to 10K gold. 14K TRI-COLOR ROSARY. 20" LONG 48.50 GRAMS WEIGHT. YELLOW/ROSE/WHITE COLOR. Condition is New without tags. Shipped with USPS First Class Package. In good condition. Plated/coated gold. IT IS A CHARM/PENDANT FOR A NECKLACE. IT IS 10 KARAT YELLOW GOLD. THIS IS JUST AN EXAMPLE. EVERY COUNTRY HAS DIFFERENT RATES. THE ITEM YOU SEE IN THE PICTURES IS THE EXACT ONE YOU WILL RECEIVE. THE ITEM YOU SEE IS THE EXACT ITEM YOU WILL RECEIVE. Rose gold and yellow gold plated sterling 925 silver. Beautiful and delicate triple strand necklace Embellished with diamond cut crystals. Made in Turkey. New Listing1/20th 10k Yellow GF JESUS on CROSS PENDANT on a 12k GF NECKLACE 1.2mm x 18"
Marked:1/20th 10k GF, 1/20th 12k GF. 1/20th 12k Gold Filled 18" Chain. 1/20th 10k Gold Filled Jesus on Cross Pendant. Chain Size: 1.2mm x 18". Pendant Size: 1" x 5/8" with bail. SD C 1 13. Sterling Silver 925 Long Yellow Gold Plated Box Chain Link Necklace 34.5"
This sterling silver box chain necklace features gold plating and a lobster clasp. 925 Sterling Silver. Then we turn around and pass those savings onto you. New Orleans Silver and Gold. Item Number. The pendant is marked 1/20 10K Gold Filled. New in box, never worn. Overall, necklace still looks really nice and pretty! 14kt gold snoopy chain in perfect condition. Box is in great condition too. Beautiful unique white gold necklace. 18K white gold. 10k gold crucifix pendant antique. Unknown to owner. Origin , maker. Marked 417 ASK stamp on right center backside. Joining link.Single . Bail will accommodate chains up to 1/8".17" leather cord necklace is included. Smoke free, pet free location. This chain is in excellent visual condition. (OKLAHOMA 8.517%). I am more than happy to give you a quote. Ending Saturday at 9:46AM PDT1d 18hMetal: Gold BondedLength: 18 - 19.99"
Solid 925 Sterling Silver Plated in Gold. Necklace Star Stamped 925. Star Charm Stamped 925. Size 20" Necklace. Ring Clasp. 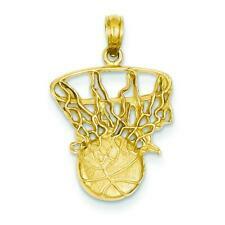 This is a beautiful new 14K Swoosh Basketball and Net Pendant. It is a great gift for yourself or a loved one and makes the perfect addition to any jewelry collection. Stamped: 14K. This item includes. Genuine jasper gemstone elephant pendant with 14kt gold plate accent. 8.5g weight.